The rumbles from the wagon train were retreating into the distance. Everyone had offered condolences. One kind lady had left enough bread for two meals. But nobody could spare her the time to help bury her husband. It had been such a small thing. The wagon had stuck, and Johnny had crawled underneath and told her to ease it forward. She’d pulled the ox’s harness, but Olly had kicked the cow, Chloe, and the wagon rolled back and crushed Johnny. An hour ago he’d been alive. Just a single hour. Johnny had been so full of life, his blue eyes refusing to consider surrender. They’d only been married a month. Now all that was left was his canvas-wrapped body. And a hole that needed to be dug. Margaret scrubbed tears from her eyes and heaved another scoop of earth. She had to bury her husband. It was the only gift left she could give him. It had seemed like a glimpse of heaven. She’d plucked far too many chickens for a few pence a day. She’d do anything to get that moment back, to warn him. To feel Johnny’s arms around her again, hear his rough voice tell her they’d find a farm of their own in record time. She didn’t know how she’d live through the day, or who would bury her if she died. A woman alone on this cruel road—her chances weren’t good. But she’d bury Johnny first. She cut through a root and celebrated by wiping the stinging sweat from her eyes. The hole was still far too small. And shallow. Grimly, Margaret widened the grave. And struck a rock. No, she couldn’t afford this. She bent over and pried the rock loose. She rolled it away from the edge and halted, panting. Walking to California wasn’t easy, but her muscles weren’t accustomed to digging. She allowed herself a brief respite. 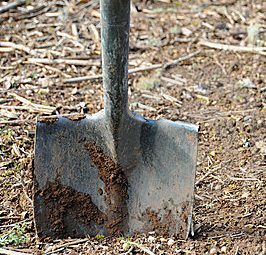 When her breathing slowed, she picked up the shovel again. It was hard to say which was slower, the crawl of the wagon’s shadow or her incremental progress on the grave. Her back begged for a rest, but she put ten more shovels of dirt on the pile first. Her world had condensed to this hole. Nothing was real but the grind of the shovel and the soft patter of dirt. Her shoulder muscles strained with every heave, echoed by the answering twinge in her back. She tore into a loaf of bread as if it was the author of her sorrows and washed it down with water. They should have joined a proper wagon train, one with a trail guide and men who would help her. But those outfits required more coin than they’d had. Everything was spent on the wagon, oxen, and supplies for the journey. The people they’d traveled with were chance-met companions, nothing more. She had wept over leaving her china shepherdess behind. Johnny had wiped her tears and carefully crated it for her. Why had she cried over something so small, a thing that sat on a shelf? She didn’t know that person anymore. The woman she’d been only a month ago. The woman she was today needed to bury her husband. She stuck the shovel into the dirt, trying to think only of digging. Johnny wouldn’t have let anything stop him from taking care of her. He’d told her their wedding was the happiest day of his life. The shovel dropped and Margaret bent to catch it up. One more shovelful. And then another after that. It was better when the world was small. She could never go back. Nothing stopped the cruel passage of time. A flicker of movement caught her eye and she jumped. Just a hare. Johnny had always kept his gun to hand in case he could put something in the stewpot. But by the time she staggered up the dirt steps, the hare was gone. Was it deep enough now? She had to be sure. Once Johnny lay in his grave, she wouldn’t be able to lift him out. She held the shovel next to him. His shroud was about two shovel heads high. She climbed back in and measured. At least another foot. She would bury Johnny properly. He had never failed her. She threw another shovelful onto the pile and groaned at the burning in her shoulders. Another foot. Surely she could manage another foot. It took her two more breaks, but it was finally deep enough. She collapsed onto the dirt steps she’d dug. Another meal and she’d find the strength to do this. She covered him back up and tugged, bracing her feet against the side of the grave. She screamed as her arms cramped. Everything had to go into this pull. She wasn’t sure she could do another. And then Johnny slid, just an inch at first, and his entire torso followed in a sudden rush. Margaret landed in the grave and gasped for breath, the wind knocked out of her.Johnny’s head and shoulders hung over the edge, as if he was waiting for her to finish. She didn’t think she could shift him without any downward momentum to help. She tried wrapping her arms around him and turning to face the grave, pushing with her legs instead of pulling. Muscles gave voice to the scream she could not, not if she was to finish. In a final rush, Johnny fell in his grave, with Margaret collapsed on top. She struggled to her feet. Her mind was rebelling at the sheer awfulness, and her vision blurred. She braced herself against the walls of the grave. She couldn’t afford to collapse. Not until she was done. She smoothed a fold on Johnny’s shroud and climbed the steps, leaning against the shovel to manage each one. Please, God, let filling it in be faster. She’d dug this grave the entire afternoon. A raindrop landed on her arm. This had to get done now. The first shovels of earth were blows to her heart as they fell. Each one took her further from her husband. She would never see him again. The faithful duty cut like betrayal. It was better when the shroud was masked by dirt, although the tempo of the rain increased to a patter. She couldn’t lift the shovel anymore–she had to rake the soil back. As the pile dwindled, the desire to be able to think, “I have buried my husband,” instead of, “I am burying him,” grew to a frenzy. Anything to have this in the past instead of the relentless present. To know that Johnny was safely buried, not staring up at the naked sky because of her weakness. The last dirt landed on the grave and Margaret’s shoulders slumped. Almost done. She had no boards for a marker, and she’d been warned that graves were despoiled in the wilderness. There was only one way to be certain this one wouldn’t be found. But Margaret couldn’t bear not to leave any token at all. She crawled, rolling the stone she’d moved earlier, to the center of the grave. Then she hitched Olly and Chloe and led them over Johnny’s grave, back and forth. Until it looked like nothing had happened here at all. She led the team down the trail, leaning heavily on Chloe. If they could catch up to the wagon train, they’d stand a chance. Oh God, I was right there with the poor but brave woman. Great writing, fantastic. Powerful story and very well written. Thanks so much, Adele and Annika. This one was a stretch. And when I was done, I wasn’t sure if it was any good for anyone but me. It was such a small story. I wrote it as an homage to my great-grandmother’s grandmother and all others like her, who showed incredible everyday courage on the overland trail–whether they were headed for Salt Lake City, Oregon, or California. Wonderful, Cathleen. Kept me engaged right to the end. Well done. Cathleen, This was a powerfully told story. I felt the woman’s pain and exhaustion and sadness and desperation. Very nice. “cruel passage of time,” indeed. Great descriptions of the woman’s struggle, sorrow, and determination. The heartbreak and screaming muscles are palpable. I lived every minute with Margaret in her toil. Whew. What a life. Thanks, Bette, Tess, and Teherah. I wanted to take you to the very edge of desperation. Very, very sad, and completely in the moment. Very well written. Thanks, Southpaw. High praise indeed, and it helps a great deal. It’s so easy to end up desperately doubting ourselves in this writing gig. Such an unfortunate turn of events. My heart goes out to Margaret. A very well written story, Cathleen. Simply marvelous and truly heart breaking. Thanks, Heena. 🙂 Your spooky camera was a great read, so that means a lot. Heartbreaking. I felt like I was in her mind, seeing with her eyes. A brilliant piece of writing.